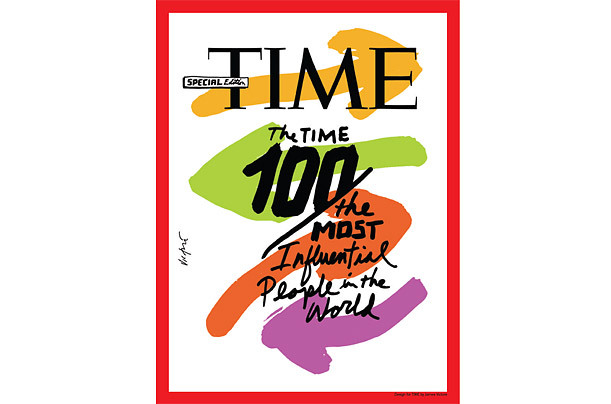 Speaking of James Victore, he designed one of the covers for the latest issue of Time Magazine’s 100 most influential people (above). There are five covers in all, the other designed by Neville Brody, Euro RSCG, and two by Chip Kidd, you can see all of them here.It looks like you can only get the Chip Kidd cover in Adelaide, a pity, because I think James’ is the best – it’s an excellent graphic but not at the expense of not looking like a ‘Time’ cover ( a bit of a failing on the part of the other covers in my humble opinion – Time magazine has one of the most recognisable cover identities around). So congratulations to James, one of the nicest people I met while away – it’s great that his work will get to be seen by such a wide audience as the Time readership.